After another very successful History Weekend, I would first like to thank all the great speakers (see below), but equally the brilliant audiences we had at all 27 events from ‘Saturn’s Fury’ puppet show in Waterstones on Friday morning to Dr Michael Jones’ talk on the Black Prince and Professor Carenza Lewis’ lecture on new discoveries about the impact of the Black Death that were the last parallel events on Sunday afternoon. Without YOU the audience the Weekend would be meaningless, and your enthusiasm, engagement and searching questions covering the wide range of topics on offer was wonderful from the organisers’ perspective – THANK YOU! Before I come to some of the events, I would also like to thank a few other groups who helped to make the Medieval Canterbury Weekend 2018 such a great occasion. Firstly, my fellow organiser Dr Diane Heath, who has done a sterling job over many months, including compiling and designing the souvenir brochure, not only chaired several sessions and gave her own lecture on medieval animals at the Weekend, but also stepped into the breach when one of our speakers became very ill and had to withdraw about a fortnight ago. Diane’s workshop at The Beaney entitled ‘Talking Heads’ was one of the best events for at least one person (from the feedback questionnaires). We have always been well supported by Professor Louise Wilkinson, who again came up trumps with a great talk and then chaired several sessions. Our Welcome Team of student helpers ably assisted Mary-jane Pamphilon, our Reception Manager, and were also on hand to assist people as well as being on the doors of the lecture theatres and being on the hand-held mics for Q&A sessions. The Black Prince, the Sheriff of Canterbury and several members of the Welcome Team. The AV Team in the form of Dave (Saturday) and Adam (Sunday) were extremely helpful regarding checking the microphones as necessary. Hospitality staff did a grand job at the kiosk and it was a major relief knowing that people could get teas and coffees on both days. 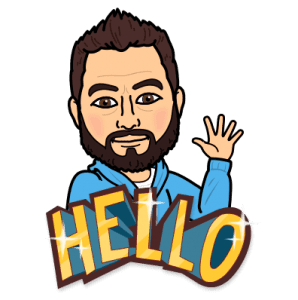 Similarly, Craig, with Colette and Liz did a brilliant job at the University’s bookstall and this gave speakers/authors a chance to sign copies for eager book buyers. Our colleagues among the Associate Lecturers: Drs David Budgen, Seb Browne and Pip Gregory, with Pip’s sister Nikki from the library in Augustine House helped out by chairing lectures or working on the guided tours; and from the university’s School of Humanities, Drs David Grummitt, Martin Watts and David Hitchcock contributed similarly, as did Matthew Crockatt, our web expert, who was also on hand to take photos and he is now compiling ‘legacy’ webpages so that others can get a taste regarding events at Canterbury. Moreover, as a first when the burglar alarm went off in Old Sessions at lunch time on Sunday, many thanks to Security for coming to sort out the problem. 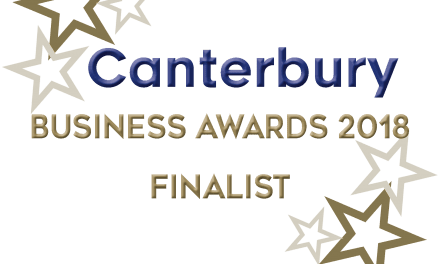 And, finally, for this section, thanks are most definitely due to our partners at The Canterbury Tales (Lyndsay Ridley and her team), Canterbury Archaeological Trust (Professor Paul Bennett’s two guided tours) and Canterbury Cathedral Archives & Library (Cressida Williams’ archive visits). 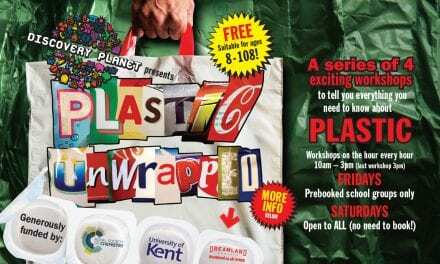 So, what was so special about the Medieval Canterbury Weekend 2018? Well one of the things I think is significant is that people were prepared to come from as far away as Uppsala in Sweden and New York in the United States. Within Great Britain, too, we drew people from a wide geographical area from Fife in the north to Truro in the south and Wicklow in the west, with others from Cardiff, Newcastle, Shropshire, Grimsby and Northamptonshire among a host of other places beyond the south-east where we have a very strong following. 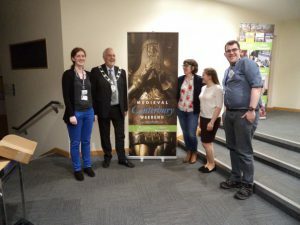 Furthermore, these people (final total tickets almost 2000) came because, like the speakers, they have passion for medieval history, and they wanted to learn more and engage with others with a similar passion. 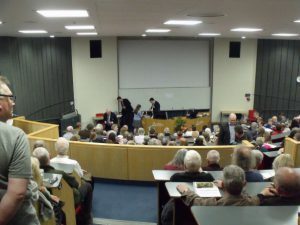 As in previous years the buzz of excitement was palpable in the various lecture theatres, in the Old Sessions foyer and on the various guided tours. The Black Prince, the Sheriff of Canterbury and Leonie Seliger. Secondly, having invited the Sheriff of Canterbury for the opening lecture on the Friday night, it was great to see how much he, like the rest of the audience, was spellbound by Leonie Seliger’s talk about the history of restoration and conservation of Canterbury Cathedral’s medieval stained glass since the two major periods of destruction during the Tudor Reformation and 17th-century Civil War, followed by times of neglect and over-zealous activities by so-called experts. Moreover, her description of recent developments in conservation, such as the application of what were thought to be valuable protective coatings; but have since been seen as causing far more problems, was a real eye-opener. However, what really came over throughout her talk was her deep knowledge and passion for her subject, as well as her great respect for her medieval predecessors, some of whose techniques have still yet to be rediscovered. One of those in her audience was Professor Richard Gameson, who had come south from the University of Durham. Richard is working with chemists at Durham and elsewhere to explore the composition of the pigments used in medieval illuminated manuscripts. Consequently, he is very interested in the production and use of medieval colours, and he and Leonie had a couple of fruitful discussions after her lecture and again on the Saturday. As a consequence, he is going to come back to Canterbury with his scientific equipment and find a way of testing some of her medieval glass fragments to see if he can determine how the colour was produced. An example of knowledge exchange within the academic world that can at some future date become available in outreach terms. For on this occasion Richard’s lecture on Saturday afternoon focused on the pigments used to illuminate manuscripts produced in Canterbury between the 10th and 12th centuries, looking not only at what the pigments were made from but what this can tell us about the financial health or otherwise of Christ Church Priory and its great Benedictine neighbour St Augustine’s Abbey. Having been guiding tours to St John’s Hospital, dating from c.1080 and a true gem of a complex of medieval buildings, and Canterbury’s Black Friars, where the sheer scale of their church is difficult to grasp and where we looked at how the surviving refectory building might have been used, I missed the various talks on Saturday morning, such as Imogen Corrigan on medieval mariners, Dr Paul Dalton’s examination of Duke William’s march through Kent following his success at Hastings, Richard Eales’ exploration of crusader castles and Professor Michelle Brown on early artistic development in Britain. Nor did I hear much on Saturday afternoon either, because, having chaired Professor Stephen Church’s discussion of Henry III desire to position himself as a pious rather than a martial king, we had previously agreed that Diane Heath would chair several more talks while I acted as the person anyone came to if any issues arose. This meant I didn’t hear people such as Dr Helen Castor’s lecture on Joan of Arc; Dr Marc Morris’ discussion on just how bad King John actually was; Professor Louise Wilkinson’s investigation of Eleanor de Montfort’s amazingly useful household accounts, or Professor Carole Rawcliffe’s dissection of the world of the medieval surgeon. 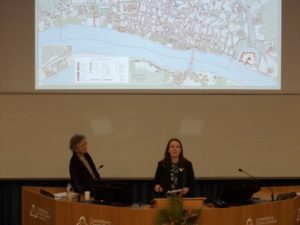 However, what I did hear were glowing reports about these talks, and it was especially gratifying to hear people singing the praises of the Centre’s and CCCU’s Louise Wilkinson. 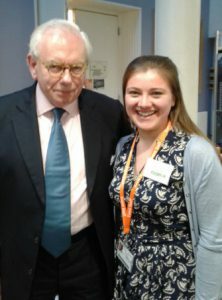 The day ended with Dr David Starkey’s discussion of the role and influence of John Fisher and Stephen Barron, the powerful royal confessors at the heart of Henry VII’s court, and how their influence paved the way for Henry VIII’s intensely clericalist regime during the early part of his reign. As one member of his packed audience said afterwards, it was absolutely brilliant to hear such scholarship, as well as the chance to talk to him afterwards – a real treat! Similarly, for her audience, those listening to Diane Heath exploring the world of the medieval bestiary, it was a chance to find out what different animals meant, another truly exciting experience. For, as those of you who are regular readers of the blog know, Diane has a passion for medieval animals and the sophisticated way they were used in the bestiary to provide moral and spiritual teaching, allegory being second nature to our medieval forebears. This brings me to Sunday, and, while Diane was at The Beaney leading her workshop on ‘Talking Heads’, I took a chance that things would be quiet and headed into the lecture theatre to hear Professor Caroline Barron discuss who may have been reading Chaucer’s works, both during his lifetime and in the first couple of decades after his death. She has uncovered some fascinating reading networks among the innkeepers and others of Southwark, and to the north of the river in the city of London several networks linked, for example, to the Tailors’ Guild, to the Guildhall clerks and to the Inns of Court. Yet, as she said, this will probably remain speculative because these copies of Chaucer’s works were not the de lux versions today found in private collections or national archives, but the medieval equivalent of the paperback that is far less a precious treasure and more a commodity to be read and passed around until it fell to pieces. Unfortunately I missed Janina Ramirez’s talk on early Canterbury saints, but because she was ‘periscoping’ her lecture you can still hear it and it will be easily accessible from the Centre’s webpages as part of the Weekend’s Legacy once Matthew Crockatt has set up the twitter thread and other ‘goodies’, such as the chance to download the souvenir brochure as a pdf. Once this is up, I’ll let you know. 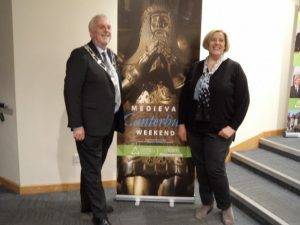 In the other lecture theatre Dr Clare Wright was enthralling her audience with an examination of the range of dramatic performances available to medieval audiences that went well beyond plays and included tournaments, mumming and Robin Hood games. This brings me to the closing lectures, and, while Michael Jones discussed Canterbury’s chivalric hero – the Black Prince – if you are in Canterbury do visit his tomb in the Cathedral, Carenza Lewis (University of Lincoln) took her large audience, including the Lord Mayor and Lady Mayoress of Canterbury, on a voyage of discovery about what pottery finds can tell us concerning the local and regional impact of the Black Death. 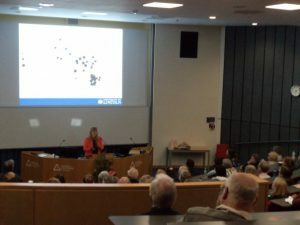 When she showed first a diagrammatic representation of the number of pottery finds in the 1-metre test pits for the medieval period before the Black Death at certain East Anglian villages, and then for the later Middle Ages, the level of shrinkage in pottery finds (on average dropping by about 42%), the gasp of surprise was audible around the lecture theatre. Moreover, as Carenza said, this pilot project needs greater exposure to involve as many community groups as possible to move from a regional to a national perspective, and, if she gets her way, with the right funding, this will become an international endeavour. Carenza Lewis discusses the impact of the Black Death. Thus, as you can see we packed a great deal into these three days, but people who had come for much of the Weekend continued to be extremely enthusiastic as they headed away from CCCU after the final talks. Moreover, the student helpers, though tired after their efforts, were still excited as they headed off to the pub clutching their Madame Oiseau hand-made ‘Thank You’ chocolate bars. This only left Karen Brayshaw, from the University of Kent who had helped by chairing two talks, Imogen Corrigan who had come back after lecturing on Saturday morning, Diane Heath and I. Having ensured all was in order, we too headed off, but, being of a more sober disposition, we went to have tea and scones, where we chanced to meet a couple from Berkshire. They had been at the Weekend, which they had greatly enjoyed, and were taking an hour off before they left for home, having found the city to be a very enjoyable place to visit. Now you might think that this is the end, but Diane and I will be joining Dr Ellie Williams on Saturday when we hold a further ‘Young Medievalist’ event – skeleton workshops for three Young Archaeologist Clubs (YACs), and I’ll report on what happened there next week. An Introduction to our latest Sponsor – Vattenfall.